With so much going on in the world today, it’s very possible that you and your loved ones could someday find yourselves in a predicament where you will need to defend yourselves. If faced with sudden danger, would you know what to do? Have you discussed with your family what you will do in the case of emergencies? Do you have the resources needed to get through a crisis and fight off dangerous assailants too? Here's 5 tips to get your Home Defense Plan in order today. If you're not prepared, don't worry because you still have the chance to do so. But once disaster strikes, there’s no going back, you can only move forward and what you have at that point is all you may get to survive the chaos until things get restored back to order. Which can be any infinite amount of time. One of the reasons many individuals don’t prepare is because some don’t know what they need or where to start. This article will help you out. The first step in preparing your family for anything is to have a family discussion so everyone can express their thoughts and ideas while working out the home defense plan. Talk about what you will do in case you are not together when disaster strikes and where you will meet. Go for a drive and plan which route you will take in case you have to leave home that won’t be loaded with others also trying to get away from danger. Appoint a friend or family member that you can all notify to let them know you are safe when separated and ensure everyone carries their correct contact information. Go through your survival gear together to learn how to use everything and get them ready for use. Put batteries in electronics that require them, open packaging and assemble anything that needs to be put together. I recommend investing in the Essential 2-Person Emergency Survival Bag. In addition, designate each individual with their own task that they will be responsible for in a situation. Then have regular practice sessions to make sure your plans will work and everyone knows their part. More importantly, never let others know that you are preparing. Keep in mind that desperate times call for drastic measures. Which means those in desperate need of resources and who know you have them available, may turn violent against you to take what you have. However, it doesn’t hurt to put a little extra away for someone else in need. This may also help to prevent violent escapades as well. Visit this website for more about family planning. Another very important part of preparing is to put together a survival kit that contains everything needed for you and your loved ones. With the sole aim to get through a situation until things are back to normal. Moreover, it’s a good idea to invest in good strong packs such as this Military Tactical Assault Backpack, to keep your gear in while making it easier to lug around. Keep your gear in a spot where it will be easily accessible that way you can just grab it and go if you have to leave in a hurry. Try not to overstuff your bags (only include a laser RangeFinder if truly necessary) since you don’t want to make them too heavy or cause them to break open while on the run. Not only that, but the less you have in your bags, the easier it will be to find what you need. Try to pack a bag that each family member can carry. The following are some basic items to consider adding to your kit. 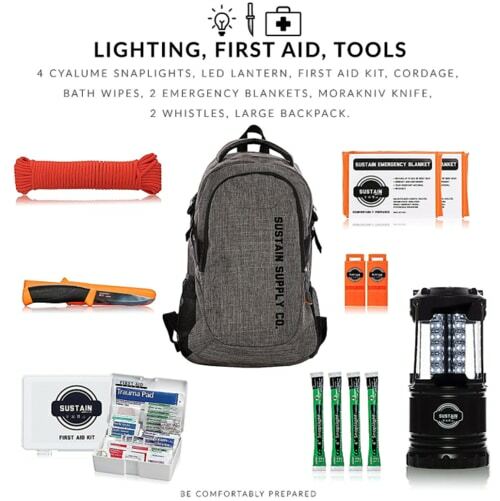 You can find more bug out bag essentials as well as valuable information here. You don’t have to get everything at once, but you should at least get the most important items first. Anything extra you can get later by purchasing a few items each week or whatever your budget allows. It doesn’t have to cost a fortune to prepare for disasters. They have sales and deals taking place everywhere. You just have to put in enough effort to find them. It would be great if you can prevent those who mean you harm, from entering your house in the first place. Unfortunately, there is no guarantee that locks and bolts will keep someone hungry from gaining access to your house. Even iron bars can’t stop them from going right through the walls. The good news is, if they do get in, your home defense plan will keep you ready for them. Next, install security cameras all around your house and face them where you can see everything outside. Again, if you can afford to add a professional security system, that would be better. I recommend the Zmodo Wireless Security Camera System. Remember to also place signs outside your house to show those approaching that there are cameras recording their every move. Have each individual in the house take turns watching the cameras. When you are faced with situations like a disaster try to lay low. Gather all members of the household together, preferably in the basement or another room that’s furthest away from the doors and windows. Keep the sound and the lights down so that it looks like nobody is home. In contrast, you still want to light up the outside of your home with bright lights, so that your signs can be read. And keep the perpetrators in the spotlight to where they are easily spotted. Here’s where things get scary. Although many Americans are aware of the dangers we face. Like storms getting more severe, major earthquakes expected to take place any time now, terrorists and large solar flares threatening to take out our power grids, and more. Only a mere 17 percent of Americans have prepared. What will the other 82 percent do for the resources they may need if a major event takes place? Especially since the stores will more than likely be closed or cleaned out by looters. I’ll tell you what they are going to do. They are going to try to get resources from those who have them, including you. Fortunately, you will be ready for them. The most common tactic used for defense in a survival situation is pepper spray. Which is very effective as it burns the eyes so badly, it will bring anyone down to their knees. But a stun gun (also known as a Taser) is another effective way to render someone helpless. If you're looking to go down this path, I'd recommend the 3-in-1 Sabre Pepper Spray. It's also police strength rated. There are also clubs that you can purchase to add to your survival kit and more. You can find many useful items and to be honest, how you handle an assailant is entirely up to you. Since I don’t know what you are capable of. For all I know you may be a black belt in karate or better yet, a ninja. So that’s for you to decide. When you are approached by an assailant, the main thing is to try to stay calm so you can think clearly. First, try talking. Ask what they want and if you can help them out, then do so. If nothing else works, the idea is to disable them, without injuring them too badly. But you must do what it takes to ensure your family's safety. Once they are down, grab your paracord, and tie the assailants hands and feet up securely. Then check their person for weapons or anything else that can pose a threat to you and your family. Call the police and wait for them to remove the assailant. Of course it may take some time for them to get there so keep both eyes on the perpetrator at all times. When it comes to yours and your loved one's survival, you can never be too prepared. Therefore preparing is not a choice it’s an ongoing necessity. However, it doesn’t have to be a hassle or time consuming. You shouldn’t have to do it alone. Get the family involved and make it a family project that you can all do together. Setting aside a few minutes a day or several hours a week to work on prepping is all it takes. Once you have the basics, you will feel confident knowing you have done the right thing to protect your loved ones. Should a disaster strike your area or some other unforeseen event, you will know your home defense plan is solid.